It was a grey, wet day outside, a bit muddy, but what else do you expect at this time of year, so a bit of cheering up was on the cards and I decided that I needed to do a bit of baking. I sent a message to a very good friend who is having a bit of a tough time, saying ‘baking today, any special requests’…..? 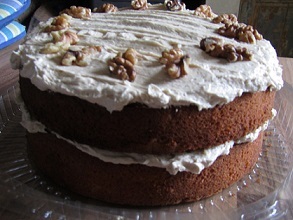 It didn’t take long before the phone was ringing.. a very excited lady on the other end asking could I please make a Coffee & Walnut cake with coffee butter cream filling…. So that was the decision made .. I gathered all the ingredients together and started the baking session. I have found this recipe to be a fail safe recipe, easy to bring everything together, and 25 minutes baking time, then it is only the waiting time for the cakes to cool so the icing can be smothered over it….. I weighed the butter into a bowl and popped it into the microwave for 10 seconds just to make sure the butter was soft and easy to whisk, I whisked it for 1 minute making sure the batter was light and soft, then I added the sugar and again whisked until it was all combined and light and fluffy. Then it was the eggs, I added the first egg, gave it a bit of a whisk, then the second and then a spoonful of the flour mix, whisked it again then the final egg and all of the flour mix, I gave it a good whisk until it was all combined. I used a shot of espresso coffee with 1 tablespoon of Kahlua, for the added hit, you can leave out the alcohol if you prefer. Then it was the turn of the chopped walnuts to be added and we were there. I buttered and lined 2 x 8 inch (20cm) cake tins and split the batter between both tins, it worked out at 493g in each tin, it is a very good idea to weigh the cake mix into the tins to ensure you have 2 equal layers, of course the weight will be slightly different each time due to the eggs. Once the cakes were cool, I mixed up the coffee icing, and then I used half of the coffee butter cream for the filling and the remaining, I generously spread across the top and then a few pieces of walnuts on top for the decoration and voila it was ready……..
As you can imagine I was delighted, but it was nothing in comparison to my friend who was squealing on the other end of the phone, when I called to say it was ready…. I dropped off the cake and waited for the update. It didn’t take long, it was delicious and they had to try another piece just to make sure it was nice, and again in the morning for mid morning coffee, just to make sure the flavour was still there……. I am glad I thought about it as for me I love baking and a simple gesture it all it took to make her very happy. I hope you enjoy this recipe too, we did and it is so versatile. Try it, I’m sure you will feel the same. 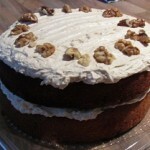 Delicious coffee and walnut cake, soft and luscious with lashings of coffee butter cream. Ideal at anytime of the day. Pre-heat the oven to 200c conventional/180c fan/Gas 5. Butter and line 2 x 8 inch (20 cm) cake tins. Weigh the butter into a bowl and if need be, place it into the microwave for 10 seconds, to ensure the butter is nice and soft. Using an electric whisk, beat the butter until it is light and fluffly. Add the sugar to the bowl with the butter and whisk again until it is all combined and light and fluffy. Weigh the flour into a bowl and add the baking flour, stir to combine. Add the first 2 eggs, individually and beat them into the butter and sugar mixture, then add the 3rd egg and a little flour (this will stop it from curdling). whisk again and then add the final egg and the remaining flour mixture. Add the coffee and again using the whisk, mix to ensure the coffee is fully combined into the mixture. Chop the walnuts (not too small) and add to the batter, again giving the mixture a quick whisk to make sure everything is well combined. Place 1 of the baking tins on to your scales and pour half of the batter into 1 tin, then do the same with the tin and half of the batter. I managed to get 493g into each tin, it is useful to weigh the mixture into the tins to ensure you get 2 equal layers to your cake. It is the eggs that will change the final weight of your layers. Place the tins into the oven, for 25 minutes, check with a toothpick to ensure that they are completely cooked in the centre. Place the butter into a medium bowl and place in the microwave to soften (if required). Add the icing sugar and mix together with a spoon to bring together, add the coffee or liquor (your perference). Mix together. Then using an electric whisk, whisk the contents of the bowl together at medium/high speed for 3-4 minutes until you have a light fluffy butter cream. Leave to the side until the cake is completely cold, before adding the butter cream to the top of both layers. Place one layer on top of the other and then dress with the remaining walnut pieces. Remember to weigh the batter into your cake tins, this will ensure that you have 2 even layers for your cake.